The mission of NeighborLink Indianapolis is to offer an improved quality of life to very low-income senior homeowners and homeowners with disabilities in Indianapolis, Indiana by providing free home repairs and modifications necessary to allow older people to remain in their own homes safely and with dignity. Many of these homeowners are living in unsafe, non-functional, or uninhabitable structures, and losing their homes prematurely because they lack resources to repair or maintain them. Without the necessary resources they have nowhere to turn for help when home-related issues arise. We are volunteer-based and community-supported through churches, schools and businesses who share our concern for some of society’s most vulnerable members. We offer twelve categories of home repair and modification services including plumbing, heating, electrical safety, ceiling and wall repair, floor and tripping hazard issues, roofing problems, water penetration, maintenance related painting, yard work, major cleanup services, safety and accessibility and resolving Health Department citations. We have no payroll or facilities expense. We have approximately 1,200 volunteers that we can call upon – a combination of skilled as well as those that can provide general assistance. Skilled volunteers are recruited through contractors and contracting associations, such as plumbing and heating contractor associations and electrical contractor associations. Non-skilled volunteers are recruited from schools, churches and businesses. An interested volunteer typically brings a friend with him or her and the number grows. Many schools have requirements for their students to perform community service. We make that easier for them because we are organized, have scheduled projects, are insured and always have projects for them. Churches want to serve the community but struggle to find the kind of opportunities that get them in contact with people in real need and that provide a personal and rewarding experience. NeighborLink works hard to provide all of that, and all they have to do is show up. Businesses are critical to providing NeighborLink with volunteers. We ask our current volunteers to open doors for us into their employers. We offer the business the ability to provide their employees with community service opportunities in a meaningful, organized, and tailored environment. We choose and shape the volunteer experience to each company’s needs, be that team building, visibility to the community, scheduling limitations, or location. We make it easy to accomplish their goals while we get work done for our senior clients. The volunteers brought into contact with Neighborlink in this way become our future advocates and potential donors, because seeing the problems of our seniors first hand is very motivating to them. Businesses who work with NeighborLink often become partners in other ways such as providing in-kind donations of materials or providing grant funding. In 2017, using volunteers and donated funding, we completed nearly 400 projects. Our funding partners have realized the importance of the work we do as well as our ability to stretch funding by leveraging volunteer efforts and donated materials whenever possible. We have become a key component of the social services fabric of our community by offering services which our clientele cannot obtain from another provider. We believe that we have defined and implemented an innovative model which can be implemented in cities across the country. How collaboration worked: We have established important collaboration partnerships for both funding and operations. Our funding partners have realized the importance of the work which we do as well as our ability to stretch funding by leveraging volunteer labor and donated materials whenever possible. Every dollar we spend buys the equivalent of five dollars of services provided at retail. Funding partners include organizations with focus on seniors and/or low-income housing such as Central Indiana Senior Fund, PNC Bank Foundation, Old National Bank Foundation, and the Indiana Neighborhood Housing Partnership. Operationally we partner with local churches, schools, and businesses which are the primary source of the over 400 volunteers that we engaged in 2017. We organize volunteer days for businesses and we host youth mission trips to work on NeighborLink projects. We interact with other organizations and function as the focal point when issues require involvement of others. As examples, we partner with: •	Neighborhood Christian Legal Clinic for addressing seniors’ legal concerns. •	Marion County Health Department for homeowner citation situations. •	Central Indiana Council on Aging for home safety modifications. •	Indiana Neighborhood Housing Partnership (INHP) to fund major projects such as complete roof replacements which are beyond the means of NeighborLink to address. We will provide advice to homeowners about the INHP alternative and will provide services which are required to facilitate the homeowner’s ability to obtain INHP funding. •	The local gas company to provide furnaces when replacement is the only alternative. Details on older people's involvement: In the past we staffed the leadership roles with young, passionate volunteers but quickly lost them to higher priorities of job and family. We have learned to staff these rolls with retired men and women who want to help and have the time and ability to perform the role. This results in seniors leading younger volunteers to help seniors in need. The impact of our services can be seen in the number of homeowners that were able to remain safely in their own home as a result of the services which we provide. Our impact is reflected in the increased number of projects that we perform – from 100 in our first year of operation in 2013 to nearly 400 in 2017. The impact of our services can also be seen in the number of referrals which we receive from local government and social service organizations when they receive requests for help from low income seniors and homeowners with disabilities who have no place else to turn. The impact of our services is also reflected in the continued support of our donors who select NeighborLink Indianapolis as the vehicle through which their funds can be put to the best use. Feedback from our clientele regarding the assistance which we have provided to them is always positive. They are very appreciative for the projects that we complete which they could neither do themselves nor afford to pay someone else to complete. Our client appreciation often turns emotional when a problem is addressed after they previously thought that they had exhausted all alternatives. The demand for our services and the need to work within volunteer availability constraints requires us to triage problems in order to provide priority to the homeowner with the most serious need. As such, there is a realization that our lead times are often lengthy which can be frustrating for our clients. Our Sustainability and Growth Program (described below in response to a subsequent question) will increase our capacity which will permit us to respond more quickly. 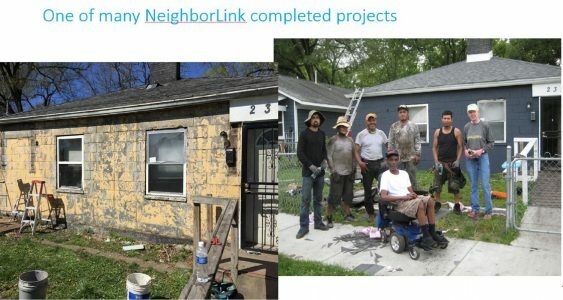 NeighborLink Indianapolis provides much needed home repair services upon which low income seniors have become dependent. We are currently operating at our capacity which is far below the demand for our services. Our long-term goal is to expand our services to meet all of the needs of the rapidly growing population of vulnerable seniors and homeowners with disabilities with a full suite of home repair and modification services, and to establish NeighborLink Indianapolis as a permanent and sustainable part of the social safety of the city. We recognize that our organization must evolve in order to support our planned growth as well as to ensure that NeighborLink is a sustainable service provider in our community. We have defined a multi-year sustainability and growth program which we embarked upon in late 2017. Our Sustainability and Growth Program will allow us to put the necessary organizational infrastructure in place to become a self-sustaining nonprofit We plan to grow capacity by 15% per year in order to meet the home repair needs of over 600 vulnerable seniors and homeowners with disabilities annually by 2021, and to grow as needed in the following years. During the implementation of NeighborLink Indianapolis we learned rapidly that bringing on more community partners earlier would have made matters easier. Coordination is a challenge, but trying to carry the workload of ever increasing demand with just a few hands is crushing. The more partners connected the better it all works. The size of the problem and need for help was a big learning point as well. Without advertising our services we were quickly overwhelmed with requests for help by the senior community and by other help agencies who wanted to refer seniors in need. Low-income seniors needing home repairs and modifications are a substantial part of the community and the need is terribly under served. And lastly, there is a real balance to be struck between use of volunteers to stretch resources and use of professional trades people to get things done right, safely, and in a timely manner. The secret is using both and letting one facilitate the other. It works but requires learning and good judgement. The greatest restraints we encountered were and remain obtaining funding and volunteer resources. After a number of false starts, volunteer resources were successfully addressed by building relationships with local churches, businesses and schools so that volunteers were available on an ongoing basis. Professional trades type resources are also essential. It was necessary to build programs to attract skilled volunteers, and to build partnerships with local contractors and associations that involved paying for services but with significant discounts. The funding issue was always a worry but we found we had a good story to tell after we operated successfully for a few years. Our first grant application was described as “the worst I’ve ever read”, but we were awarded the grant. We learned quickly from that experience and realized that it’s the relationships and our results that count. So once we had one partner supporting us we leveraged that to build another and another. We were effective in showing results and telling our story which gave potential funders the confidence and a reason to support NeighborLink. We are still learning but it’s a lot easier now.